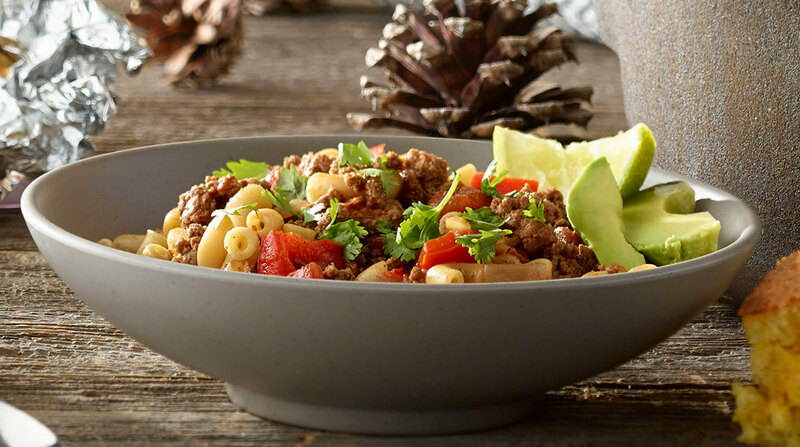 There’s something to cooking over a campfire that makes everything taste better. The smell alone easily evokes sense memories of those childhood camping trips: beautiful views, attempting to construct a tent and maybe a burnt marshmallow or two. 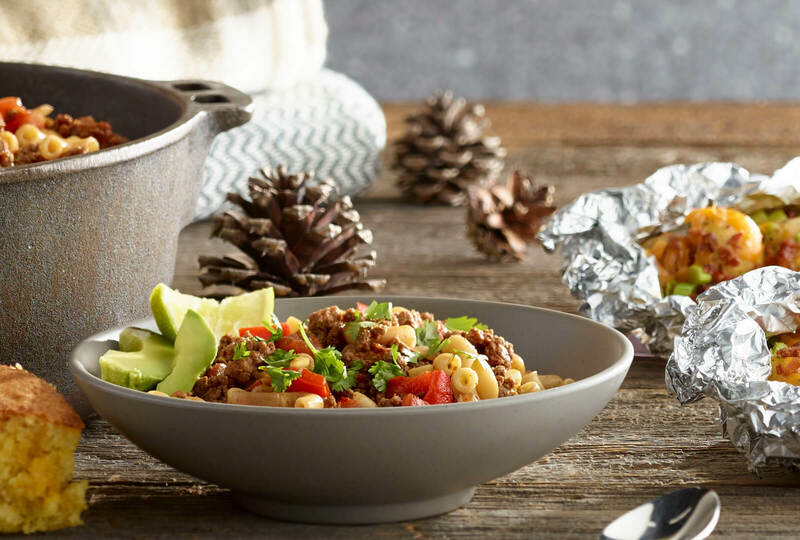 Bring your group together at home or outdoors and try your hand at our favorite fire-friendly meals. Heat oven to 350°F. In large bowl, stir together peanut butter and next 5 ingredients. Shape dough into 2-inch balls and place on cookie sheet; lightly flatten. Bake 15 minutes. Top with marshmallows and slightly press into center. Let cool completely. Lightly brown marshmallows with kitchen torch, if desired. 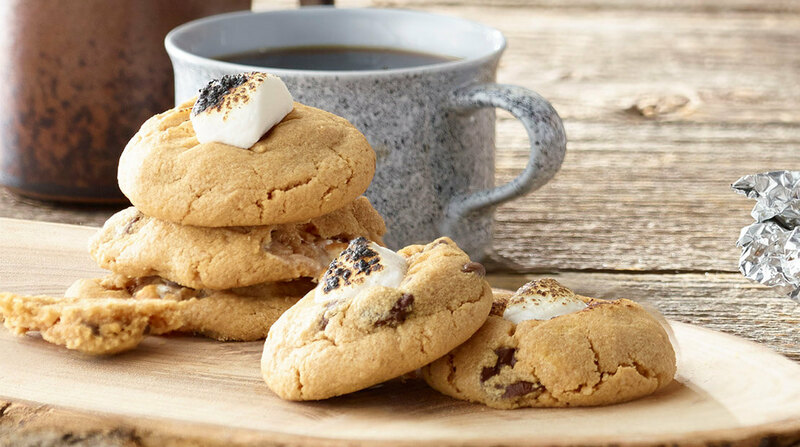 Over the fire: Bake cookies ahead. Rather than quartering marshmallows, roast whole marshmallows over fire and press between two cookies. Heat oven to 425°F. In large bowl combine potatoes, olive oil and steak seasoning, tossing to coat. Tear 4 (8-x 12-inch) sheets of foil and lightly coat with cooking spray. Divide potatoes evenly among foil pieces, placing in center and folding or pinching foil to seal. Place on baking sheet and bake 30 minutes or until potatoes are tender. 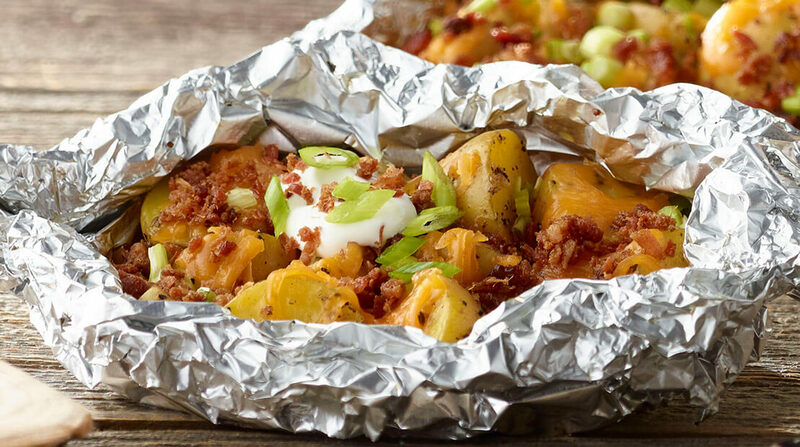 Carefully open foil and sprinkle potatoes with cheese, green onions and bacon bits. Place open foil packs in oven and bake 8 minutes. Over the fire: Place foil packs over hot embers, out of direct flame. Remove from heat when potatoes are tender. In large Dutch oven, over medium-high heat, heat oil. Sauté onion 7 minutes or until tender. Add ground turkey and cook 20 minutes, or until no longer pink and liquid has mostly evaporated. Stir in chili powder, cumin and coriander and cook 2 minutes. Add taco sauce and remaining ingredients. Bring mixture to a boil. Reduce heat to medium-low and simmer 20 minutes or until pasta is cooked. Over the fire: Preheat base of Dutch oven directly over hot coals until smoking. Prepare recipe as noted above in Dutch oven and cover. Place hot coals on top of cover, varying amount to control heat. Carefully remove from coals when pasta is cooked.